An easy weeknight dinner that is sure to please! 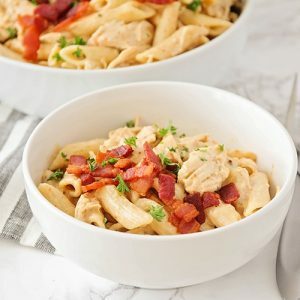 This Chicken Pasta is made in your slow cooker and uses just a few delicious ingredients! Spray the insert of your slow cooker with non-stick spray. Place chicken breasts in the bottom, and season with salt and pepper. In a small bowl, stir together the cream of chicken soup, sour cream, garlic, and ranch dressing mix. Pour the mixture over the chicken. Cook on high for 3.5 hours, or on low for 6-7 hours. Remove chicken from the insert and shred. Return to the pot and mix thoroughly. If desired, add in steamed broccoli and/or bacon crumbles. Spoon chicken mixture over cooked pasta noodles, and enjoy!